Often times while performing penetration tests it may be helpful to connect to a system via the Remote Desktop Protocol (RDP). I typically use rdesktop or xfreerdp to connect to host once I have obtained credentials to do all sorts of things such as use Active Directory Users and Computers or SQL Management Studio. One of the roadblocks I have ran into is that my client is protecting access to RDP on Windows with Duo. This can be a real pain, especially when port 3389 is the only port open on the jump box that I need to be able to pivot to another network. Last time this happened I found an article by Alex Lomas on Pen Test Partners which detailed the methods that you can use to bypass this. These attack methods are valid assuming that the target had configured their Duo implementation to “fail open”. This is actually very common, as it is the default setting. 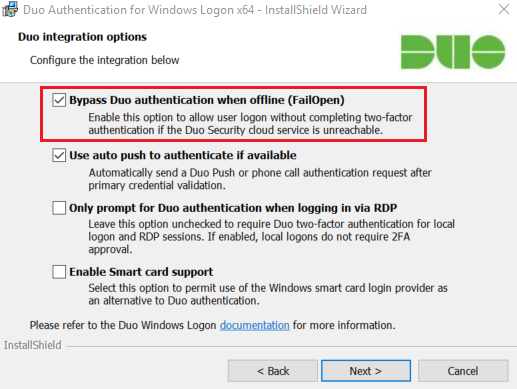 If a system has Duo 2FA configured to fail closed and they lose internet connectivity or have issues with DNS, they get completely locked out of their workstations/servers. This is not acceptable for all but a few organizations and thus fail open is the most common choice. I will typically pipe this to a file in case it is really big and I need to parse it. The contents need to be reviewed to locate the Duo API DNS entry. Each unique Duo install will have a different API endpoint that it speaks to. If for some reason there is nothing in the DNS cache, it may be required to trigger an authentication request. If this must be done, avoid using an account that you know is enrolled with Duo as this may send a push message, text message, or email to their phone. The next step is to edit the hosts file on the system. This requires administrator access. Go ahead and back up the original hosts file. After doing that, modify the current hosts file. This can be done simply by appending it with a single entry that maps the Duo API endpoint to localhost. At this point you should now be able to RDP into the system with just a username and password if Duo is set to fail open. Restore the hosts file when finished. If you do not have administrator credentials or SMB/WMI/etc is not available, you can deny access to the Duo API with a Man-in-the-middle (MITM) attack. To perform this you can use Bettercap. Bettercap is described as “The Swiss Army knife for 802.11, BLE and Ethernet networks reconnaissance and attacks.” For our attack we will use it perform an ARP spoofing attack and a DNS spoofing attack. The first step is to perform an ARP spoof. The target will need to be set to the IP we are trying to access. Bettercap will trick that host into believing we are the default gateway. To perform this attack the attacker must be within the same broadcast domain as the victim. If this is not the case, the attacker may have to utilize a different method other than ARP spoofing to gain a MITM presence. Bettercap will automatically enable forwarding. 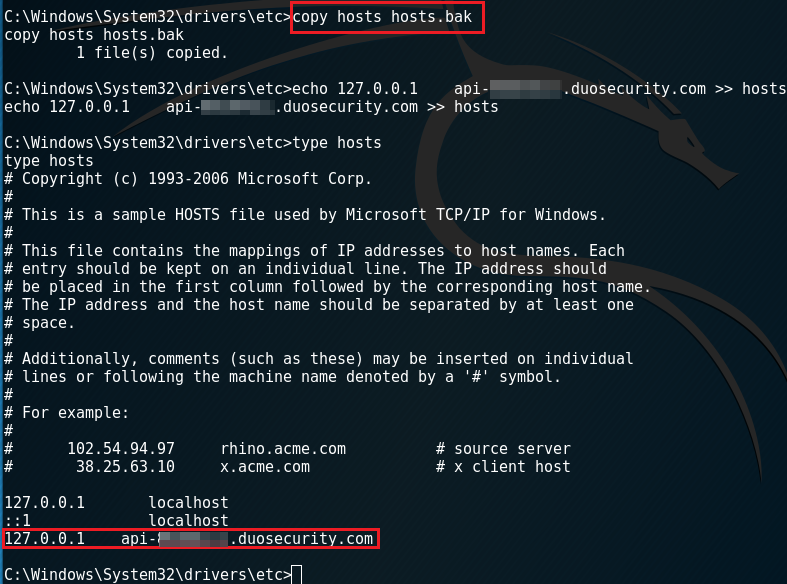 This will modify any DNS query for a subdomain of Duo security. It will respond with the attacker IP address, which is fine because we just want to break the API from working properly. While this is running, the attacker can now log into the system via RDP without needing to use 2FA. Once logged in, quit Bettercap. Bettercap will re-ARP the target but it may take a few minutes before the DNS entry expires. While this requires something other than default settings, I have seen a few clients check the third box, “Only prompt for Duo authentication when logging in via RDP.” Many times administrators want to prevent remote attackers from authenticating, but have more trust in users who have physical access. The problem that I have found is that a “local” logon can also be performed remotely in some cases. If the client is using VMware or Hyper-V to virtualize some of their infrastructure, this could be used as an additional attack path to access Duo protected systems. Often times I will see that after gaining credentials, there will be a VMware web interface available to connect to. Users may also be able to connect with the Hyper-V or VSphere software client. Once connected, each virtualized system can be connected to via the virtual console. When you connect to the console, the system treats this the same way they would a local logon. Because of this, Duo will not prompt for MFA. While in many cases you may not need to gain RDP access to achieve your objectives an attacker, it can be extremely helpful. One of the cool things about RDP is that if you connect with credentials that have an active session, you will take over the desktop session of that user. This can be useful if that user had their KeePass, Lastpass, or 1Password vault open, or if they are actively logged into an internal resource on the web or via software on their system. In the case of internal web resources, it is possible to pull cookies from the browser on disk, but certain things like HTTP basic authentication headers I do not believe reside anywhere on the hard drive, and you could only recover that data by dumping memory. While tools like KeeThief can sometimes pull the password from memory once shell access is obtained, RDP can often make this easier as well as account for other types of vaults or authenticated software that is less understood.